Love sticky, yummy sugary cotton candy. Brings out memories of the good ole days at the fairgrounds when you walked around and tried not to get it in your hair. Enjoyed every bite! 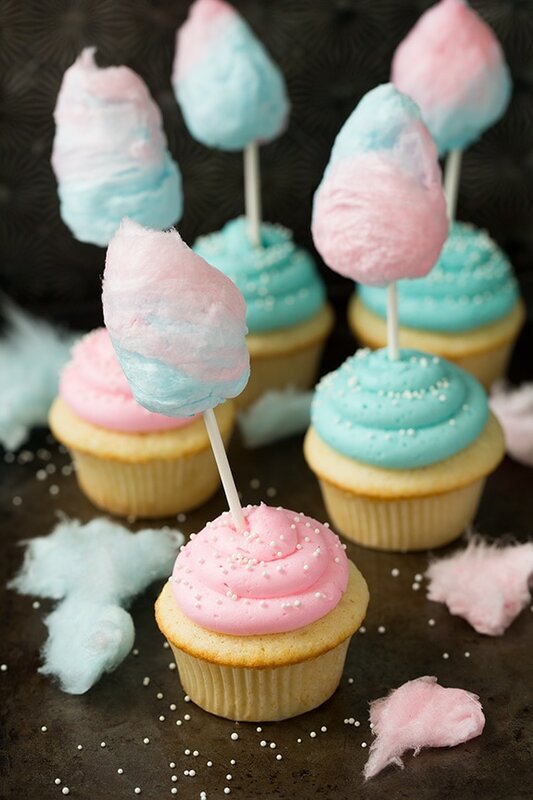 Cotton Candy Cupcakes recipe is easy to make. All you have to do is purchase the cotton candy already made. One individual purchased the Dunkin Hines Frosting Creation Flavor Mix Cotton Candy and remarked it didn’t taste like cotton candy. The recipe author used Lorann cotton candy flavor; however, also felt like she would use a different brand next time. Another individual suggested using the actual cotton candy. Add a half ounce to speckle throughout your cupcakes then for your frosting melt the rest with the buttercream & turn it into a liquid form to flavor your frosting. Recipe author remarked great idea except you may end up with a swiss meringue style frosting. Sift all-purpose flour and cake flour into a mixing bowl. Add baking powder and salt and whisk dry mixture, 20 seconds, set aside. In the bowl of an electric stand mixer, fitted with the paddle attachment (recommend a beater blade – don’t have one, stop periodically and scape the bowl while mixing) whip together butter and granulated sugar until pale and fluffy. Mix in egg, then mix in egg whites one at a time, blending until combined after each addition and adding in vanilla with last egg white. Working in three separate batches, beginning and ending with flour mixture, add 1/3 of the flour mixture (to the butter/egg mixture), alternating with 1/2 of the milk and mixing just until combined after each addition. Divide batter among 12 paper lined muffin cups, filling about 2/3 full (about 1/4 cup batter in each). Bake in preheated oven until toothpick inserted into center of cupcake comes out clean, about 18 – 21 minutes. Cool in baking pan several minutes then transfer to a wire rack to cool completely. In an the bowl of an electric stand mixer fitted with the paddle attachment, whip butter until pale and fluffy. Mix in cream, cotton candy flavor and powdered sugar (adding additional cream 1 tsp at a time as needed). Whip until light and fluffy, tint with pink or blue food coloring if desired. Special Thanks To CookingClassy For Recipe Posting & Image Screenshots.